"He will roam across the universe and its galaxies, and in the end will again become its brightest star," said one commenter on the Chinese microblogging network Weibo. Another said: "He belongs to the stars, and has returned home now." Many people in China grew up reading Prof Hawking's seminal book A Brief History of Time - the circulation of the Chinese-language edition is reportedly second only to that of the English. His 2006 visit to China was covered with breathless excitement, with state media comparing his appeal to that of Tom Cruise. And when he joined Weibo in 2016 - saying hello to "my friends in China" - he was met with a rapturous response, amassing millions of followers within hours. Prof Hawking was, of course, beloved around the world, but the adulation and respect he has always commanded in China is perhaps in another universe altogether. Scholars and academics have traditionally been held in high regard in Chinese culture, which also prizes a hard-striving and disciplined work ethic. Having overcome great odds in his life, he was seen as having these qualities in spades. "We all admire his creativity and his spirit of research, despite the extreme difficulty of his physical situation," Tsinghua University professor Shing-tung Yau told the BBC. Prof Yau, who helped to arrange Prof Hawking's visits to China, added: "He was very friendly and was willing to explain physics to laymen. His smile attracted the attention of everybody... the Chinese are grateful for his generosity in spending time in China." Image caption A cartoon on Weibo depicts Hawking's famous wheelchair with the caption: "Travel well, you who is in a parallel world". Prof Hawking also came along at a time when modern China began accelerating its scientific and space ambitions. Thus, a role model ideal for the Chinese state to champion emerged. 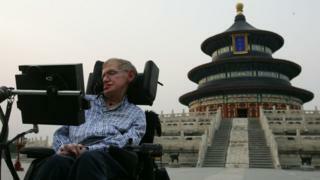 "Hawking has near-superstar status in China, and the Chinese government preaches that scientific prowess is crucial to the country's future power," reads one report carried by state media in 2006. It also helped that he was generally not critical of China - at first - and was happy to play to the crowd. "I like Chinese culture, Chinese food and above all Chinese women. They are beautiful," he told his audience at an appearance during his last trip, while also praising the Chinese for being "very clever", "hardworking" and having "achieved a lot in science and technology". More recently, he delighted younger Chinese when he interacted online with another Weibo star. Wang Junkai, the lead singer of popular boy band TFBoys, had in November asked Hawking a question about interstellar migration, and Prof Hawking praised him for asking an "excellent question". After news of his death emerged Wang posted on social media: "You will forever belong to the universe and the stars. I will etch your teachings on my heart." But in his later years Prof Hawking had some criticism, most notably for one of his greatest concerns - artificial intelligence. In a video appearance in Beijing last year, he warned China of the rise of powerful AI, saying "we should do all we can to ensure that its [AI's] future development benefits us and our environment". 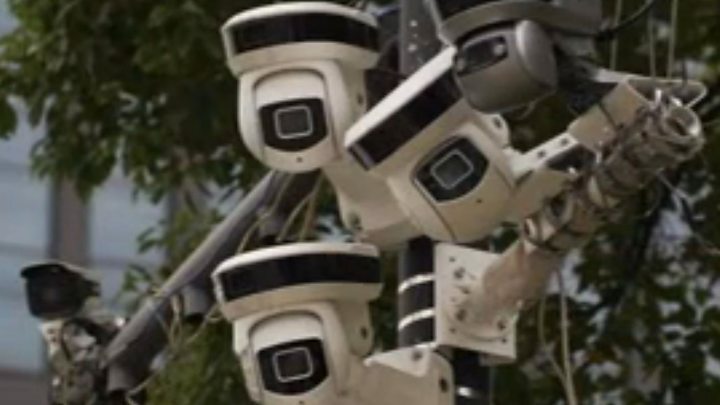 China is now one of the world's leaders in investing, developing and using AI technology, such as using facial recognition to catch criminals - and to keep a close eye on the population. But he also genuinely believed in China, particularly its younger generations and their power to change the world, and sometimes addressed them directly on Weibo. In 2016 he wrote a special message of encouragement to Chinese students taking the important gaokao college entrance exam, telling them to "be fearless". In his response to Wang, he praised China's millennials for being curious and thinking about the future. "My hope is that as you pursue science and other ideas, this curiosity and confidence will continue," he wrote. And in one of his last posts on Weibo, he thanked his millions of followers. "It has been an illuminating experience being able to communicate with all of you here. "I look forward to seeing what the talent and inquisitiveness of the Chinese people achieves in the realms of science and space." His obvious affection for China has perhaps intensified the sense of loss among young Chinese. Image caption The professor joked while in China that he found Chinese women "very beautiful"
Among the moving tributes written by a netizen and highlighted by state media was this: "Born in the ordinary dust, returned to the stars above. "I encountered this person when I was in secondary school. He told me of mankind's indestructible and legendary perseverance. He also unveiled to me the mysterious secrets of the universe's black holes. I listened to his prophecies, I accepted science's revelations. "This person has disappeared from our blue Earth, he has gone to explore the universe he so yearned to see. Have a smooth journey, Stephen Hawking." "I'm scared," said another. "[I've] Suddenly lost a sense of security about Earth."